It’s a nice feeling having a project finally see fulfillment. After a long semester of planning and organizing, we are finally getting out into the community and starting to make a difference. The last few weeks have been a huge benchmark in the life of Lincoln Park Youth Voice. Since last Monday, March 14th, this group of classmates have moved gradually from college students with a plan to positive role models for the kids in the Lincoln Park area and pillars for the University of Minnesota Duluth. We have been working together as a class to organize meetings at both the Boys and Girls Club in Lincoln Park and at Lincoln Park Middle School. Although we are working with two completely separate groups of children, and with varying ages to boot, we have made great strides in our project on both fronts. Our ultimate goal is to have these kids tell their stories; stories of hope and positivity from within Lincoln Park and to get the community excited about helping the youth of the area. 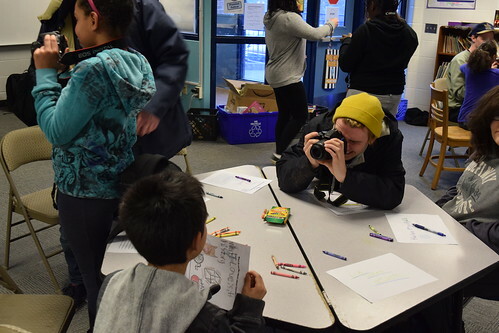 In our last session at the Boys and Girls Club Lincoln Park, we worked with the kids who wanted to learn a little bit about photography, or just to play with the cameras. We discussed what their favorite things about Lincoln Park were, and helped them explore some of the positivity within their community. We then, with the help of our facilitators at the Boys and Girls Club, were able to take them on a short walk and instruct them on how to shoot photos outdoors. The kids absolutely loved working with the cameras, and we saw a much larger engagement overall from the kids this time around. Because the kids were more comfortable with the camera in their hands, they were also a lot more prone to opening up and talking with us more openly. All around the experience was very fruitful for our project, as we got to connect more with the children, as well as collect some great material for our finished product. At the middle school we are also working with another, somewhat smaller group to help them tell their own stories and facilitate the process along the way. The group at Lincoln Park Middle, however, is taking a more traditional approach to journalism and generating their own stories. This group of kids is incredibly motivated to learn about journalism and use these techniques to tell their own stories. One group of girls is going a story on their school’s boy’s hockey team, another girl is doing a story about Lake Superior, and one boy is even doing a series of movie reviews. These opportunities to produce their own journalism is a great push for these kids, and having caring adults to help them along and guide their process, not only in these journalism activities but in life as well, is critical to their success. Hopefully this next week of sessions with these kids will provide even more material for not only our, but their successes as well.